The Northern Brown-throated Weaver was formally described by George Ernest Shelley, an English geologist and ornithologist. 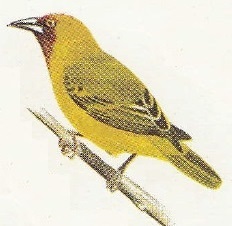 The Northern Brown-throated Weaver was collected by Emin Pasha, an Ottoman-German physician, naturalist, and governor. 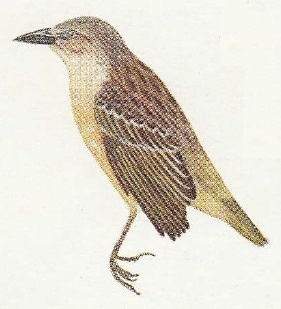 After 1876, Emin made Lado (South Sudan) in Equatoria province his base for collecting expeditions throughout the region, and here he collected type of the Cardinal Quelea. In 1881 there was a revolt by Muhammad Ahmad, and the revolt cut Equatoria off from the outside world by 1883. In 1884 Karam Allah marched south to capture Equatoria and Emin. In 1885, Emin and most of his forces withdrew further south, to Wadelai near Lake Albert, in Uganda. In August Pasha collected some male and female specimens of the Northern Brown-throated Weaver around Wadelai, and not in Lado as noted by some authors. There was a danger of the specimens being lost due to the revolt, but Rev. Mackay eventually took them to the Kenyan coast, and were sent to the British Museum. 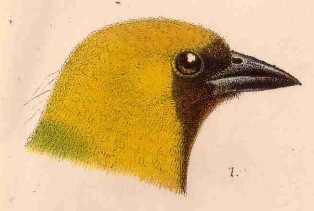 The first illustration of the Northern Brown-throated Weaver was of the head of the male published by Sharpe (1890). 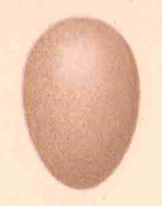 The next illustration to be published was of an egg by Ogilvie-Grant (1912), followed much later by colour paintings of the male and female in Mackworth (1955). Ploceus castanops	Shelley 1888,	Proc. Zool. Soc. London, p.35	Lado (Wadelai, Uganda). castanops, Latin: castaneus, chestnut-coloured; Gr. Ops, the face. Nile Brown-throated Weaver (Shelley 1905). Brown-faced Golden Weaver, Nile Brown-throated Weaver. There are at least 4 syntypes in the British Museum, including BM 1887.9.28.62. Identification. The Northern Brown-throated Weaver breeding male has a dark chestnut face and throat which looks black from a distance. It is distinguished from the Golden-backed Weaver and Yellow-backed Weaver when in the same papyrus swamps, by the golden yellow crown and underparts. The female has a streaked back and tawny-buff breast and is distinguished by black lores and a pale eye, a buff (not yellow) supercilium, lack of yellow on the underparts, and a more slender bill. The female Orange Weaver has a pale bill and whitish underparts. The range of the Northern Brown-throated Weaver does not overlap with the similar Southern Brown-throated Weaver. Distribution. 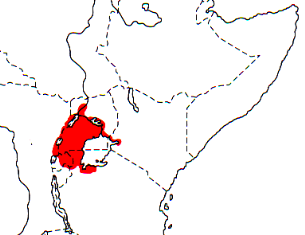 The Northern Brown-throated Weaver is locally common in Uganda and surrounding countries in the Lake Victoria basin (see map below, based on Birds of Africa). No subspecies are recognised. Habitat. The Northern Brown-throated Weaver inhabits waterside vegetation along lakes and rivers, especially in papyrus and ambatch. It visits forest and woodland habitats in the non-breeding season. Food. The Northern Brown-throated Weaver feeds on seeds, including millet, and also on insects. It forages in small flocks, often with other weavers, on the ground, in vegetation and on floating aquatic plants. The foot structure shows adaptations typical of papyrus specialists. Breeding. The Northern Brown-throated Weaver is apparently monogamous. It is colonial, with 5-6 nests in one site, but also nests solitarily. The nest is placed in tall elephant grass, low shrubs, in reeds, papyrus, bulrushes or ambatch. It sometimes breeds in mixed species colonies. The nest is rounded, tightly woven, and with the entrance below covered by a small projecting porch. The nest is built by the male from strips of grass and creepers, and lined with fine grass and some feathers. The clutch is 2-3 eggs, and egg colour is pinkish or pale blue, plain or spotted with red-brown. The chicks are fed by both male and female. Known nest predators include egg-eating snakes. Old nests may be used by Swamp Flycatchers Muscicapa aquatica.